This contract is in the form of a letter and is designed for use where an individual is appointed to provide services to a company or organisation. The services could be anything from part-time work as a drama tutor to bookkeeping. 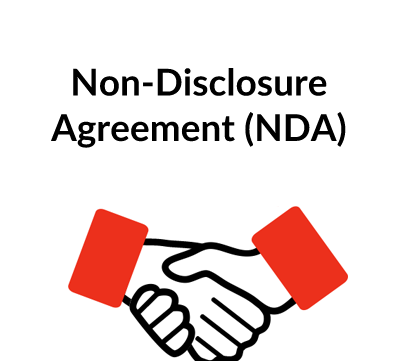 The contract will be created by an exchange of letters – the company should prepare two copies, sign both and request one copy to be returned, dated and countersigned by the individual as indicated. There are tax implications for a contract such as this – HM Revenue & Customs can in certain circumstances require an individual to be treated as an employee and subject to PAYE and NICs. There are also risks that the individual is held to be an employee for employment law purposes as well. You should take advice from an accountant or lawyer on each occasion this letter is used. 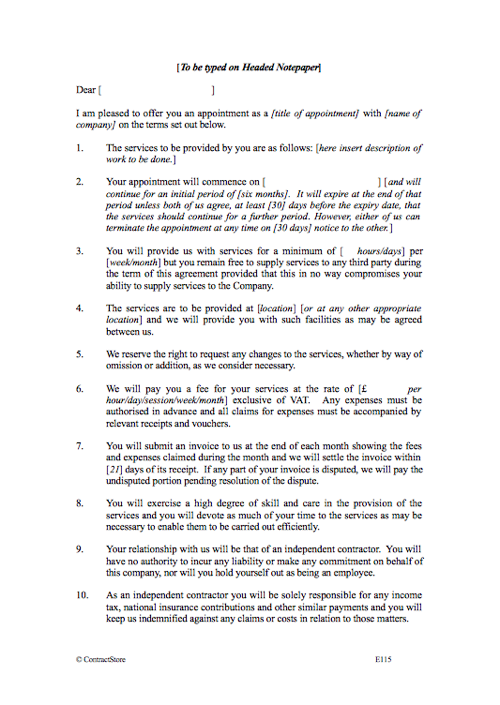 This sets out the duration of the appointment, (if for a fixed term) the start date and the notice period. The final sentence in square brackets would not be appropriate if the company wants a long-term commitment. This specifies a minimum number of working hours per week/month and needs to be adapted to the particular circumstances. The location of the services should be inserted here. This could be the home of the individual. This allows the company some flexibility, which may not be appropriate. It is preferable to give the contractor as much flexibility and control in the method and nature of the provision of the services. The fee arrangements should be inserted here. If, in addition to fees, specific expenses are agreed – e.g. travel costs at a particular rate – these should be spelt out in this paragraph. As the individual is not an employee but an independent contractor, he/she should submit an invoice at the end of each payment period and there will then be a specified time within which payment should be made. This sets out a standard of skill and care which the individual is expected to maintain as well as a commitment to the work. 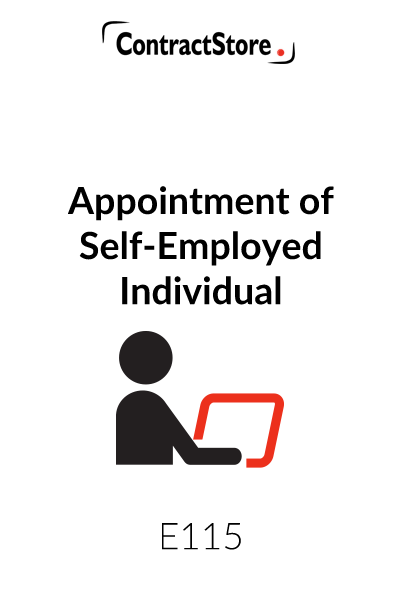 This emphasises the point that the individual is not regarded as an employee but an independent contractor but may not suffice on its own. Following on from clause 9, the responsibility for income tax and national insurance is firmly placed on the individual. However, as already mentioned, HM Revenue & Customs may investigate a situation which looks more like employment than the provision of services and they have the power to require that an individual is treated as an employee so that the employer becomes responsible for PAYE, NICs etc. As the individual is not an employee or worker, holiday would not normally be paid for and it would be to individual to agree when they go away. In the same way, illness would not be paid for. This imposes a confidentiality obligation on the individual as well as a requirement that he/she returns all papers relating to the business at the end of the engagement. The new data protection rules that came into effect in May 2018 could be relevant and the individual should be given a copy of the Company’s Data Protection Policy. If he/she is involved in any data processing, then a separate appointment or additional terms may be needed to ensure compliance with the Data Protection Act 2018. (See our documents A251 Data Protection Policy and A250 Data Processor Appointment). A restriction on the individual would not always be appropriate or enforceable especially if the individual is providing services to a range of companies, as it indicates a substantial degree of control, which may indicate an employment relationship. However, in some circumstances it might be desired but this is a difficult area and legal advice should be obtained. This paragraph is only relevant to the extent that the individual might be involved in design or the creation of other intellectual property rights. It is standard practice to include a right of substitution in order to indicate the relationship is not an employment relationship, although the authorities will consider the practical reality of the relationship. The right to terminate for cause at any time is dealt with here.